This year sees a big change in the way Formula 1 cars will perform because of key changes to the sport’s technical regulations. These are the first major changes since the move to 1.6 litre hybrid power units in 2014. The new changes will boost downforce and grip and so make the cars faster. Mercedes, Force India, Williams (well, virtually) and Sauber have shown off their cars. 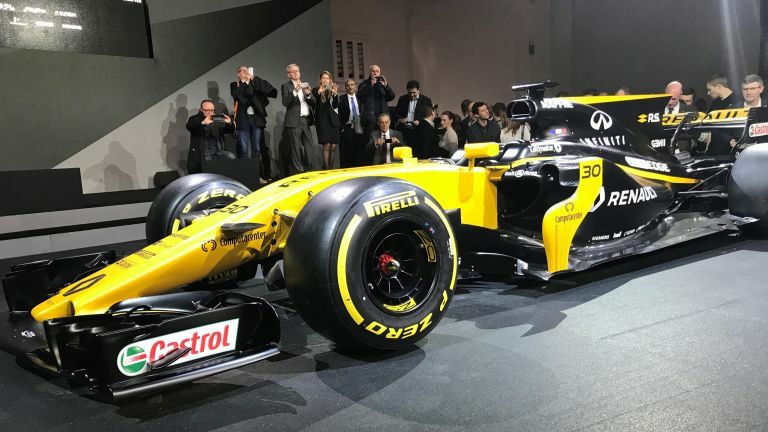 We were invited along to see the launch of the new Renault Sport RS17 car and talk all things F1 in 2017 with the team’s experts including chief technical officer Bob Bell. “2017 will be an exciting year but also a crucial year,” Jérôme Stoll, president of Renault Sport racing. This is the first year that Renault has been able to put together its own car from scratch since it opted to return to the sport in 2015, taking over the troubled Lotus team and the first year it has been able to get its chassis and engine teams in the UK and France fully coordinated. The Renault team was working on the 2017 car for all of last year having realised it wouldn’t be able to make an impression on last year’s championship because of the lack of development time. The cars are now wider (2m instead of 1.8m), with a beefed-up floor and a larger front wing (1.65m to 1.8m). The rear wing has also been lowered to a maxim of 80cm rather than the previous 95. The diffuser is now more powerful as it has increased height and length. The cars can also now be heavier, with max weight now 722kg instead of 702kg (excluding tyres). Renault’s chief technical officer Bob Bell told us that it was very likely “there would be more bodywork flying around” as a result of the larger areas of carbon fibre and wider cars. Bell, formerly at Mercedes, says “the cars are an awful lot quicker and visually appealing and that's going to make the sport more exciting”. Bell says we won’t really know whether the cars will be better for overtaking until we get to the first race in Melbourne in March. “These cars have a lot more mechanical grip,” adds Stoll, “the jury's out but we're hopeful of more [entertainment]. We won't really know until we get to Melbourne. We've built this car and rebuilt the organisation simultaneously, it's stretched everyone to the limit but we think it will be worth it”. The tyres have changed; they’re around 25 percent wider than in 2016, with rear width up from 325 to 405mm, and front width raised from 245 to 305mm. The wheel rim remains 13 inches, though the diameter has increased slightly. Next week there’s an initial test of the new cars in Barcelona, but while we’ll know more about performance and tyre wear after that, we won’t know how the cars will perform in a race scenario and, most notably, how the cars will perform driving in ‘dirty air’ behind another car. What we do know is that we’re expecting an overall performance gain of around five percent from the outset, with lap times cut by around 3.5 to 4 seconds. Bell says that there will be a minimum of a second in performance improvement over the season but it could be a lot more: “we just don’t really know yet”. Incredibly, all this performance increase will come with the same power output from the engine. “We've been investing to close the gap, we've recruited a lot of people and we're expecting this car to deliver” says Stoll. “The objective is very simple - we expect to be 5th in the championship. We have the team, the drivers and partners…I would say we are angled for the podium and success now.” Renault have increased staff numbers by around 25 percent as a result of their investment. The drivers too, will need to change. “Because of the extra downforce, grip and speed in corners it's much more demanding for the drivers,” adds Stoll. “The drivers will need to be focused on having more muscle mass than before.” That means we could see a renewed focus on muscular F1 drivers which doesn’t necessarily favour the lean rookie. What is for sure, it will make for some interesting racing when Melbourne rolls around next month.